These rugged switch plates and outlet covers are ideal for an array of interiors, from Rustic Colonial to Industrial Modern. The unique galvanized finish pairs well with iron, steel, or stainless steel hardware and lighting, perfect for kitchen or bath. 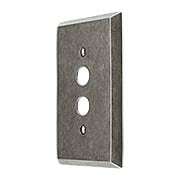 Our premium quality switch plates bring modern, industrial style to your decor. Featuring crisp beveled edges, this single toggle light cover plate complements a variety of interiors, from Industrial Modern to Rustic Colonial and everything in between. The unique galvanized finish pairs well with iron, steel, or stainless steel hardware and lighting, perfect for kitchen or bath. 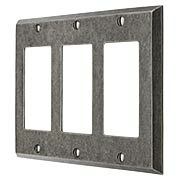 Our premium quality switch plates bring modern, industrial style to your decor. Featuring crisp beveled edges, this duplex outlet cover plate complements a variety of interiors, from Industrial Modern to Rustic Colonial and everything in between. The unique galvanized finish pairs well with iron, steel, or stainless steel hardware and lighting, perfect for kitchen or bath. 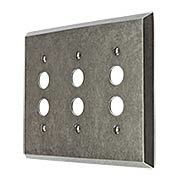 Our premium quality switch plates bring modern, industrial style to your decor. Featuring crisp beveled edges, this single push-button cover plate complements a variety of interiors, from Industrial Modern to Rustic Colonial and everything in between. The unique galvanized finish pairs well with iron, steel, or stainless steel hardware and lighting, perfect for kitchen or bath. 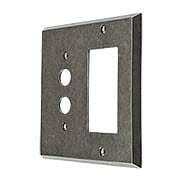 Our premium quality switch plates bring modern, industrial style to your decor. Featuring crisp beveled edges, this single GFI cover plate complements a variety of interiors, from Industrial Modern to Rustic Colonial and everything in between. The unique galvanized finish pairs well with iron, steel, or stainless steel hardware and lighting, perfect for kitchen or bath. 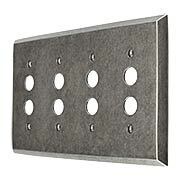 Our premium quality switch plates bring modern, industrial style to your decor. Featuring crisp beveled edges, this blank cover plate complements a variety of interiors, from Industrial Modern to Rustic Colonial and everything in between. The unique galvanized finish pairs well with iron, steel, or stainless steel hardware and lighting, perfect for kitchen or bath. 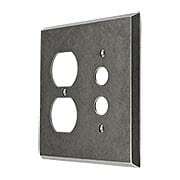 Our premium quality switch plates bring modern, industrial style to your decor. Featuring crisp beveled edges, this single gang cable outlet cover plate complements a variety of interiors, from Industrial Modern to Rustic Colonial and everything in between. The unique galvanized finish pairs well with iron, steel, or stainless steel hardware and lighting, perfect for kitchen or bath. 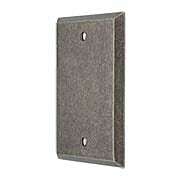 Our premium quality switch plates bring modern, industrial style to your decor. Featuring crisp beveled edges, this double toggle light cover plate complements a variety of interiors, from Industrial Modern to Rustic Colonial and everything in between. The unique galvanized finish pairs well with iron, steel, or stainless steel hardware and lighting, perfect for kitchen or bath. 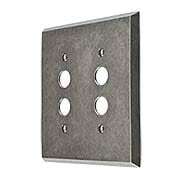 Our premium quality switch plates bring modern, industrial style to your decor. Featuring crisp beveled edges, this double gang duplex cover plate complements a variety of interiors, from Industrial Modern to Rustic Colonial and everything in between. The unique galvanized finish pairs well with iron, steel, or stainless steel hardware and lighting, perfect for kitchen or bath. 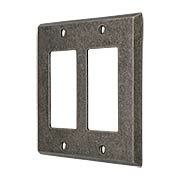 Our premium quality switch plates bring modern, industrial style to your decor. Featuring crisp beveled edges, this double push-button cover plate complements a variety of interiors, from Industrial Modern to Rustic Colonial and everything in between. The unique galvanized finish pairs well with iron, steel, or stainless steel hardware and lighting, perfect for kitchen or bath. 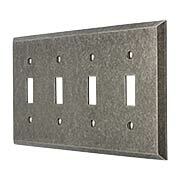 Our premium quality switch plates bring modern, industrial style to your decor. Featuring crisp beveled edges, this double gang GFI cover plate complements a variety of interiors, from Industrial Modern to Rustic Colonial and everything in between. The unique galvanized finish pairs well with iron, steel, or stainless steel hardware and lighting, perfect for kitchen or bath. 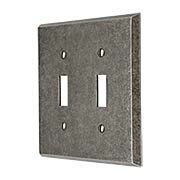 Our premium-quality Industrial Toggle/Duplex Combination Switch Plate brings modern, industrial style to your decor. Featuring crisp beveled edges, it complements a variety of interiors, from Industrial Modern to Rustic Colonial and everything in between. The unique galvanized finish pairs well with iron, steel, or stainless-steel hardware and lighting, perfect for kitchen or bath. 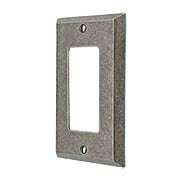 Our premium-quality Industrial Toggle/GFI Combination Switch Plate brings modern, industrial style to your decor. Featuring crisp beveled edges, it complements a variety of interiors, from Industrial Modern to Rustic Colonial and everything in between. The unique galvanized finish pairs well with iron, steel, or stainless-steel hardware and lighting, perfect for kitchen or bath. 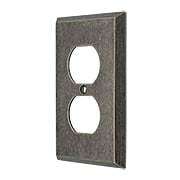 Our premium-quality Industrial Push-Button/GFI Combination Switch Plate brings modern, industrial style to your decor. Featuring crisp beveled edges, it complements a variety of interiors, from Industrial Modern to Rustic Colonial and everything in between. The unique galvanized finish pairs well with iron, steel, or stainless-steel hardware and lighting, perfect for kitchen or bath. Our premium-quality Industrial Push-Button/Duplex Combination Switch Plate brings modern, industrial style to your decor. Featuring crisp beveled edges, it complements a variety of interiors, from Industrial Modern to Rustic Colonial and everything in between. The unique galvanized finish pairs well with iron, steel, or stainless-steel hardware and lighting, perfect for kitchen or bath. 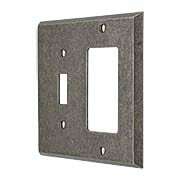 Our premium quality switch plates bring modern, industrial style to your decor. Featuring crisp beveled edges, this triple toggle light cover plate complements a variety of interiors, from Industrial Modern to Rustic Colonial and everything in between. The unique galvanized finish pairs well with iron, steel, or stainless steel hardware and lighting, perfect for kitchen or bath. 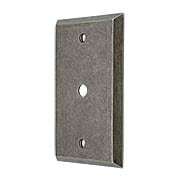 Our premium quality switch plates bring modern, industrial style to your decor. Featuring crisp beveled edges, this triple push-button cover plate complements a variety of interiors, from Industrial Modern to Rustic Colonial and everything in between. The unique galvanized finish pairs well with iron, steel, or stainless steel hardware and lighting, perfect for kitchen or bath. 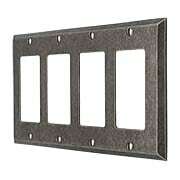 Our premium-quality Industrial Triple GFI Cover Plate brings urban style to your decor. Featuring crisp, beveled edges it complements a variety of interiors, from contemporary to rustic Colonial and everything inbetween. The uniqie galvanized finish pairs well with iron, steel, or stainless steel hardware and lighting - perfect for kitchen or bath. 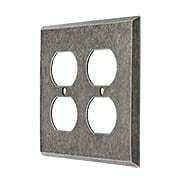 Our premium quality switch plates bring modern, industrial style to your decor. Featuring crisp beveled edges, this quad gang toggle cover plate complements a variety of interiors, from Industrial Modern to Rustic Colonial and everything in between. The unique galvanized finish pairs well with iron, steel, or stainless steel hardware and lighting, perfect for kitchen or bath. 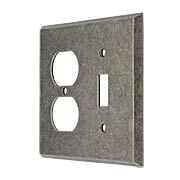 Our premium quality switch plates bring modern, industrial style to your decor. Featuring crisp beveled edges, this quad push-button cover plate complements a variety of interiors, from Industrial Modern to Rustic Colonial and everything in between. The unique galvanized finish pairs well with iron, steel, or stainless steel hardware and lighting, perfect for kitchen or bath. 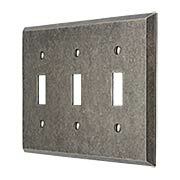 Our premium quality switch plates bring modern, industrial style to your decor. Featuring crisp beveled edges, this quad GFI cover plate complements a variety of interiors, from Industrial Modern to Rustic Colonial and everything in between. The unique galvanized finish pairs well with iron, steel, or stainless steel hardware and lighting, perfect for kitchen or bath.